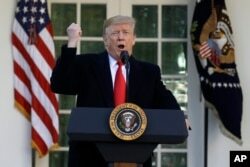 The longest government shutdown in U.S. history ended Friday when President Donald Trump delayed his demand for funding for a wall on the U.S.-Mexico border, signing a three-week spending bill that will reopen shuttered agencies and get back pay to 800,000 federal workers. The U.S. Office of Management and Budget sent a memo late Friday to closed federal government departments and agencies to inform them that their divisions are now open and their employees can return to work. The memo called on the agencies to "reopen offices in a prompt and orderly manner." The memo said the OMB appreciates the "cooperation and efforts during this difficult period" of the government shutdown. Earlier, U.S. President Donald Trump signed a three-week spending bill, ending the longest government shutdown in U.S. history. "After 36 days of spirited debate and dialogue, I see that Democrats and Republicans are willing to put partisanship aside, I think, and put the American people first," Trump said in a Rose Garden announcement. "This is an opportunity for all parties to work together for the benefit of this beautiful nation." By Friday evening, both the U.S. Senate and House had approved the legislation, which Trump then signed. The bill funding the government through February 15 does not include money for the construction of Trump's proposed U.S.-Mexico border wall. The president said that a bipartisan committee would be formed in the meantime to evaluate border security, but, contrary to previous claims, he was not asking for a concrete wall along the entire U.S.-Mexico border. "We do not need 2,000 miles of concrete wall from sea to shining sea. We never proposed that," he said. The announcement came on the 35th day of the shutdown, when roughly 800,000 federal employees missed their second consecutive paycheck. It also came shortly after incoming flights to New York's LaGuardia airport were delayed due to staffing issues, according to the Federal Aviation Administration. The FAA also said that departure delays at LaGuardia, as well as Philadelphia and Newark airports, are due to air traffic control staffing shortages. Early Saturday morning, House Speaker Nancy Pelosi named the Democratic House members — Appropriations Committee Chairwoman Nita Lowey of New York, Appropriations Subcommittee on Homeland Security Chairwoman Lucille Roybal-Allard of California, David Price of North Carolina, Barbara Lee of California, Henry Cuellar of Texas, Pete Aguilar of California — who will serve on the bipartisan committee to evaluate border security. The president issued a series of tweets Saturday morning about the shutdown and the wall, saying that after turning away two previous caravans of thousands of migrants on the southern U.S. border, a new caravan with at least 8,000 people has formed in Mexico and is headed for the U.S.
Trump then noted, "21 days goes very quickly. Negotiations with Democrats will start immediately. Will not be easy to make a deal, both parties very dug in. The case for National Security has been greatly enhanced by what has been happening at the Border & through dialogue. We will build the Wall!" Speaking to reporters at the Capitol Friday after Trump's announcement, Senate Minority Leader Chuck Schumer said Trump agreed to Democratic demands to separate the discussion on reopening the government from border security. He said he hopes Trump has "learned his lesson." 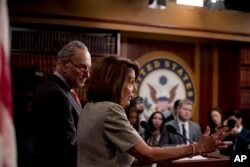 House Speaker Nancy Pelosi of Calif., accompanied by Senate Minority Leader Sen. Chuck Schumer of N.Y., left, speaks at a news conference on Capitol Hill in Washington, Jan. 25, 2019, after President Donald Trump announces a deal to reopen the government for three weeks. Pelosi told reporters, "I see every crisis as a challenge or an opportunity" and was careful not to characterize Trump's motives during the government shutdown. Trump's announcement reversed his position from Thursday, when he said he would accept a deal to at least temporarily reopen the federal government if it contained a "pro-rated downpayment" on the U.S.-Mexico border wall he has sought. President Donald Trump speaks in the Rose Garden of the White House, Jan 25, 2019, in Washington. "It's just common sense, walls work," Trump said Friday, arguing the barrier would keep out criminals, human traffickers and drugs. In an apparent reference to reports he was considering declaring a national emergency at the border, Trump said he had "a very powerful alternative" but chose not to use it. He said that option was still on the table if Congress could not come to an agreement within the three-week funding period. Senate Majority Leader Mitch McConnell said he hopes there will be "good-faith negotiations'' in the coming weeks to settle differences on border security. A growing number of lawmakers of both parties have said compromise is the only way to end the political stalemate and reopen the government. "It is long overdue for all sides to come together, to engage in constructive debate and compromise to end this standoff," Maine Republican Sen. Susan Collins said. "Shutdowns represent the ultimate failure to govern and should never be used as a weapon to achieve an outcome." The shutdown furloughed 800,000 government employees, with at least 420,000 required to continue working without pay, and the remainder sent home, some of whom have been forced to look for temporary work elsewhere to help pay their household bills. All are set to miss their second biweekly paycheck on Friday. Some government services have been curtailed, as about 10 percent of airport security agents ordered to work have instead called in sick, some food inspections have been cut back, and museums and parks are closed. Federal courts warned they could run out of money by the end of the month. Could a Mass Sick Out End the U.S. Government Shutdown?